Wildlife Protection Society of India - Our Work - Banovich Wildscapes Foundation, nonprofit (501c3) organization fostering cooperative efforts to conserve the earth's wildlife and wild places benefiting the wildlife and the people that live there. 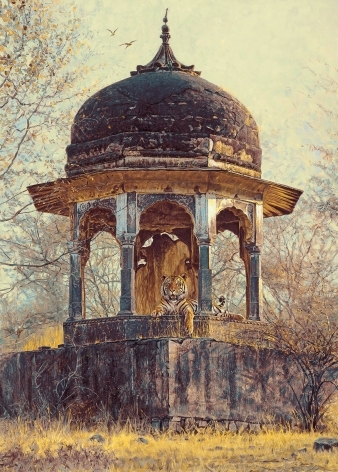 John Banovich spent February of 2002 traveling in India. His experiences in Bandhavgarh, Konar and Ranthambhore National Park is where he first encountered wild tigers. This life enhancing experience was the inspiration for the painting, Jewel of India. In an effort to support the dramatic decline of the wild tiger, Banovich has joined forces with the Wildlife Protection Society of India (WPSI). 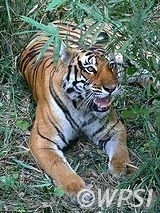 Founded in 1994 by its Executive Director, renowned tiger conservationist Belinda Wright, the Wildlife Protection Society works to help avert India's wildlife crisis by providing urgently needed support and information to combat the escalating illegal wildlife trade, particularly the illicit trade of tiger parts. It has now broadened its focus to deal with human-animal conflicts and provides support for research projects. An important element of the Society’s work is WPSI’s countrywide network of investigators. Developing information collected through this network, the WPSI team assists and liaises with Government enforcement authorities to bring about the arrest of offenders and seizure of wildlife products. A WPSI cell of expert lawyers supports the prosecution of important wildlife cases and reviews wildlife laws and campaigns for constructive amendments. With a team of committed environmentalists, WPSI is one of the most respected and effective wildlife conservation organisations in India. It is a registered non-profit organisation, funded by a wide range of Indian and international donors. The Society’s Board Members include leading conservationists and business executives. The tiger population in India is officially estimated to be between 1,571 to 1,875. Many of the tiger populations across the nation, particularly those outside protected reserves, face a variety of threats, including habitat fragmentation, encroachment, and poaching and developmental projects. These problems are directly or indirectly linked to anthropogenic factors. Decades of scientific research on tigers and their prey have provided us with a set of guidelines to develop and design protected areas to help the species survive. However, these reserves protect only a fraction of tiger habitat, and most are under severe human pressure. In the last few years, tiger poaching has increased dramatically, fueled by illegal trade in tiger body parts. Despite all these problems, India still holds the best chance for saving the tiger in the wild. Tigers occur in 18 States within the Republic of India, with 10 States reportedly having populations in excess of 100 tigers. There are still areas with relatively large tiger populations and extensive tracts of protected habitat. We need to make a concerted effort to combat poaching and habitat loss, if this magnificent animal is to survive into the future. On 15th January, 18 organizations - including WPSI - released the collective letter at the 66th meeting of the CITES Standing Committee calling for urgent action to end tiger farming and trade. Avinash Basker who heads WPSI's Legal Programme, was there at the meeting in Geneva and helped with the drafting of the letter. We the undersigned believe that a Zero Demand approach to trade in tiger parts and derivatives is essential to achieve Zero Poaching. This means an end to tiger farming and all domestic and international trade in parts and derivatives of tigers from captive facilities. That is precisely what the international community called for in 2007; however China, Lao PDR, Thailand and Vietnam continue to keep and breed tigers for trade in their parts and products. Many facilities that keep tigers are engaged in legal and illegal domestic and international trade in parts and derivatives of tigers that have been bred in captivity, and in some cases in laundering illegally acquired tigers in to the trade. There are an estimated 7,000 tigers in captivity in South-East Asia and China, and no signs that so-called tiger ‘farms’ are being phased out. The Government of China has authorised a domestic trade in the skins of captive-bred tigers for use as luxury home décor and for taxidermy. This stimulates demand for the world’s remaining 3,200 wild tigers instead of reducing it. How can we expect demand reduction campaigns to work in China if the Government itself tells consumers that it is acceptable to buy tiger skins? Tigers in India, Nepal, Bangladesh and the Russian Far East are still being targeted for markets in China and among Chinese consumers in Myanmar and Lao PDR. There is also a thriving market in Vietnam and Indonesia. Tigers are not just killed for their skins; their bones are used to brew “tiger bone wine”, their meat is sold as a delicacy, and their teeth and claws are sold as charms. As reflected by seizures, these end markets are sourced from both wild and captive tigers. So long as legal and illegal trade in tigers from captive facilities continues, demand reduction and enforcement efforts are undermined, wild tigers everywhere are at risk and the chances of recovery of wild tiger populations in China and South-East Asia are minimal. In 2007, in recognition of the risk posed by tiger ‘farming’ to wild populations, the Parties to the Convention on International Trade in Endangered Species of Wild Fauna and Flora (CITES) decided that “tigers should not be bred in captivity for trade in their parts and derivatives”. Countries with tiger farms – e.g. China, Lao PDR, Thailand and Vietnam – have failed to implement this decision. Even South Africa has engaged in this lucrative business and is exporting captive tiger body parts to markets in Asia and elsewhere. Not enough has been done to investigate the facilities involved, amend laws to end ‘farming’, destroy stocks of tiger parts and derivatives and, ultimately, end demand. A comprehensive assessment of the trade in tigers and other Asian big cats was prepared for the CITES Parties by the IUCN in June 2014. The review highlighted examples of good practice from India, where there are no tiger ‘farms’ and where over two-thirds of the world’s remaining wild tigers survive. Tiger ‘farming’ has been allowed to drag on for too long. It is time for more decisive action towards achieving Zero Demand and to hold to account those countries that are implicated in tiger ‘farming’ and trade in captive tiger parts and products. The recent deliberations at the 66th Meeting of the CITES Standing Committee confirm that Parties still want to see an end to trade in tiger parts and derivatives from both wild and captive sources. Recommendations from this meeting encourage Parties to make better use of forensic technology to investigate the origin of tigers in trade, take effective action against online trade and undertake targeted demand reduction campaigns. 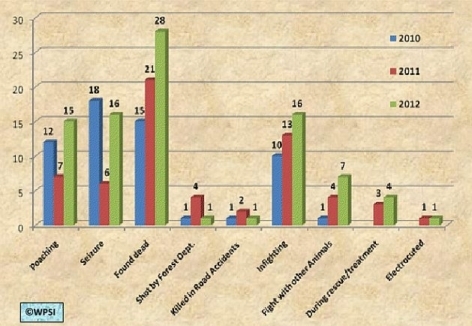 Draft decisions have also been prepared for consideration by the 17th Meeting of the Conference of the Parties that, if adopted, would require Parties to undertake time-bound country-specific actions to implement CITES resolutions and associated decisions, including the decision on tiger ‘farming’. destroying stockpiles of tiger parts and derivatives. The international community must ensure that CITES takes strong action against Parties that do not show meaningful progress in ending tiger ‘farming’. 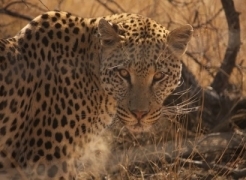 The area of the world roamed by leopards has declined by three quarters over the last two and a half centuries, according to the most comprehensive effort yet to map the big cat. Researchers said they were shocked by the shrinking of the spotted hunter’s range, and that the decline had been far worse for several of the nine subspecies of leopards and in some parts of the world. “We found the leopard had lost 75% of its historical habitat, we were blown away by that, it was much more than we feared,” said Andrew Jacobson, a conservationist at the Zoological Society of London and lead author of a new study on their range published in the journal PeerJ. The new work is the first known attempt to draw up a global, historical map of the leopard. Jacobson and researchers found that in 1750 it occupied a vast 35m sq km (13.5m sq mile) area throughout Africa, the Middle East and Asia. But after centuries of habitat loss and hunting caused by humans, that area shrank to just 8.5m sq km. Leopards in Asia have been particularly badly hit, with six regions losing over 95% of habitat where the species has been, in Jacobson’s view, “almost completely wiped out”.